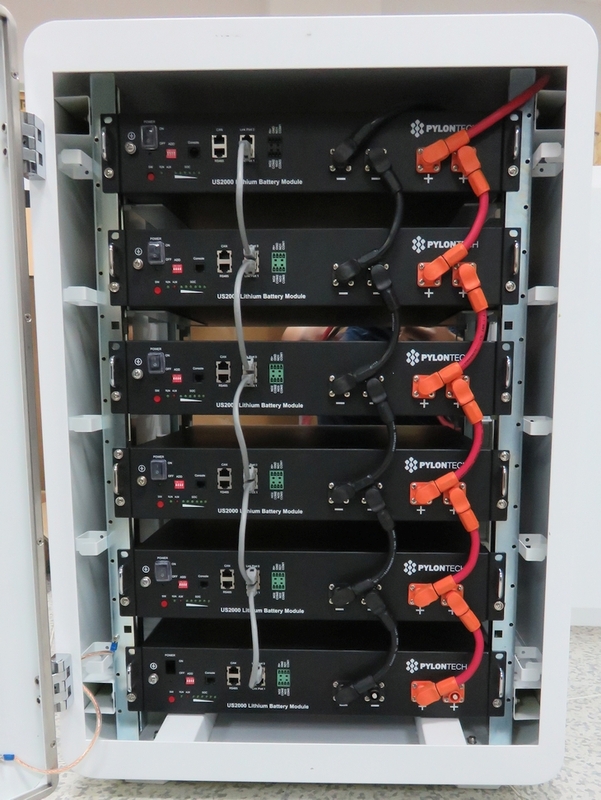 Lithium batteries come in all shapes and sizes, but for some applications such as the larger residential and commercial energy storage market it can make sense to have a modular, stackable 19″ format battery system. This often makes putting together and working on a system much easier. 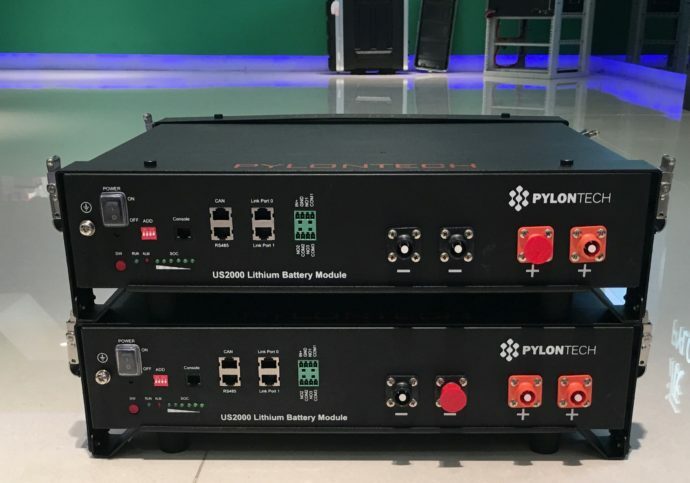 Such a format is available from Pylon Technologies, and these modular battery systems are now deemed to be compatible with all Victron Energy’s 48V MultiPlus and Quattro range of inverter/chargers, including the new MultiGrid. Victron’s local and remote (via the VRM Portal) battery monitoring & management system – the Color Control GX is a requirement for the system. 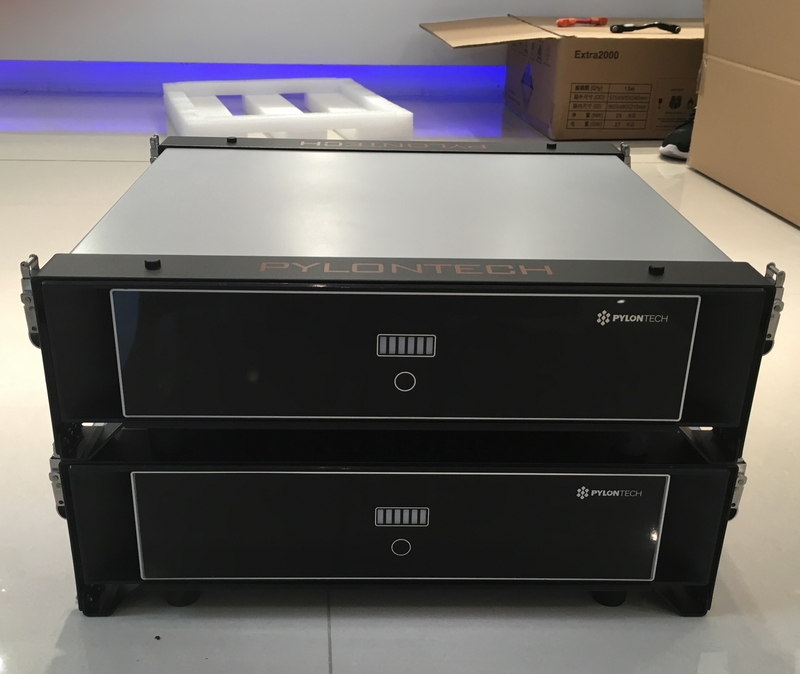 I was impressed with the PylonTech batteries; nice looking 19″ models with a neat bracket system that allows installation of a few of them without having to use an (expensive) 19″ cabinet. Within two days of testing, we could already conclude that our systems can cooperate. With PylonTech, it’s easy to configure different capacities. Multiples of their modules can be combined together and in doing so they automatically recognise each other; forming one clean operating battery bank. From the Victron viewpoint, their 48V batteries can work with all our 48V MultiPlus and Quattro range, meaning our full range from 500VA to 15000VA applies. A unique feature in the energy storage market. From Color Control GX firmware version 1.72, PylonTech systems are now supported. Two models are compatible with the Victron products detailed above. Internally these PylonTech models are the same, with only the exterior design differing to accommodate differing design tastes. The images below show these models. Each module is 48V and 50Ah. In the instances below two modules are stacked and connected together using a neat bracket system, which negates the need for an expensive 19″ rack system. For further information, technical specifications and availability of the PHANTOM-S click here. For further information, technical specifications and availability of the US2000B click here. To my mind this type of modular system makes a lot of sense, and of course the fact that these batteries are Victron compatible, along with the required Color Control GX, can only be a good thing.